A trainload of bad information is barreling down the track and needs to be stopped. Darcy Olsen, President and CEO of the Goldwater Institute, was all over the media yesterday, March 4th, propounding preposterous propositions that some state legislators are unwisely accepting as accurate and useful. First, 104.1 FM talk radio, then 1330 AM, and then Arizona Illustrated with Bill Buckmaster on PBS. Same assertions, all day long, in a well-orchestrated media blitz. This train needs to be stopped; it’s going the wrong way for Arizona. 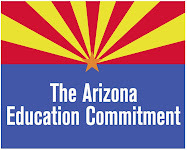 Three times I heard Darcy Olsen repeat the same preposterous claim - that there is a 1-to-1 ratio between teachers and bureaucrats in Arizona's school districts, and that's one of the reasons our students are “struggling so much to keep up with students in other states." This is incredibly misleading and intellectually dishonest. First, “bureaucrats” is a very loaded word, with myriad negative connotations. But what’s insidiously dishonest is her implied assertion that bus drivers, custodians, attendance secretaries, food service and maintenance workers are dreaded bureaucrats who waste public money - like they sit around desks pushing paper for no real purpose or no real benefit at great expense. This “wasted” money spent on “bureaucrats” is keeping our students far behind students in other states? So the solution is to cut this wasted funding? A plethora of other equally preposterous assertions were made during this media blitz. For example, Darcy Olsen said education funding has gone up in Arizona 20% since year 2000 without any gains or improvement in test scores. She said Florida spends same amount and their scores improved because of certain innovations. She said charter schools accomplish same results as public schools for 75% as much money, and more. A quick fact check shows how misleading and intellectually dishonest a majority of her assertions are. For example, we spend more on education in Arizona since 2000 because our population grew by 26.7%, not because we spent money on decreased class sizes or more advanced math classes. A couple minutes on Google shows Florida spends almost $2,000 more per pupil than we do on education, and it’s quite easy to learn that charter schools do not perform as well as she advertises. Even worse, an analysis by the Arizona Education Network of classroom instruction statistics recently published by the Auditor General reveals that, contrary to the picture Darcy Olsen wants us to buy into, Arizona spends less on administration (9%) than the national average (10.8%), and district schools spend about 8% more in the classroom and a whopping 12% less on administration than charter schools do. Some in the state legislature are using her ideas to craft legislation, like Russell Pearce and his new bill SCR 1008. She got a free pass during her media blitz yesterday, but legislators need to fact check her information and critically examine the underlying philosophical beliefs. Besides working to dismantle much of state government, Darcy Olsen is endeavoring to turn our public education system into a competitive free-market where charter schools compete with one another for students and dollars. Trouble is, in competitive markets, businesses keep their trade secrets and compete to put the other guy out of business. Rather than a competition, public education should be a collaboration where trade secrets and good ideas are shared and put to the best use by the largest group possible. Let’s turn this train around and work on ideas that serve the public interest. For more information on how much Arizona is spending compared to the national average, visit AEN's recent analysis of the 2009 Auditor General's Report. I tear my hair out when I see commentators nodding along with the Goldwater crew...sometimes the misinformation is subtle, but a "1 to 1 bureaucrat" claim? You have to be practically asleep to let that whopper of a claim slip by without comment. I can't take media sources seriously when they just churn out crap press releases like that. Goldwater in particular has been very, very sloppy lately and I wish some reporter in this state had the moxy to investigate their so-called investigations.